View from Central Park. Courtesy of Extell Development. The most important building for the evolution of our slender SKY HIGH towers -- following the path-breaking Time Warner Center and 15 Central Park West, which solidified the desirability of the southwest edge of Central Park for luxury addresses and established new records for unit sales -- is One57, which is located mid-block between Sixth and Seventh Avenues, on the north side of W. 57 St., where it enjoys both the glitter of that major commercial cross street and dead-center views of Central Park. View from 57th St - east. Courtesy of Extell Development. One57 is the breakthrough luxury project of the developer Gary Barnett, whose first real estate venture in New York dates back only to 1994. After erecting the Times Square W Hotel, a 53-story very slender tower completed in 2001, he developed the Orion, a 550-unit tall, slim apartment building on W. 42 St., completed in 2006. 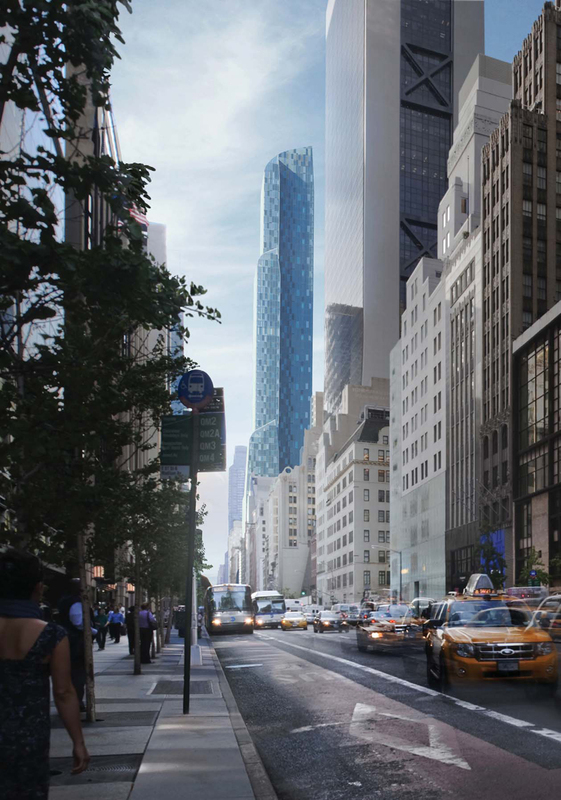 Targeted at an ultra-luxury market, One57 combined the program of a hotel and its services and amenities in the lower section and 94 condominium units in the tower. One57 at once harkened back to the late 1980s and the skinny, straight-up shafts of the Metropolitan Tower, Carnegie Hall Tower, and CitySpire (whose views of the park it now blocks) and pointed forward to the strategy of slenderness used to lift the tower extra high and to use small floor plates to emphasize exclusivity and ultra-luxury. At 1,004 feet tall (306m) and topped out and enclosed in its colorful curtain wall, in November 2013, One57 was reported to have more than 70 percent of its apartments in contract, including a penthouse for $90 million. 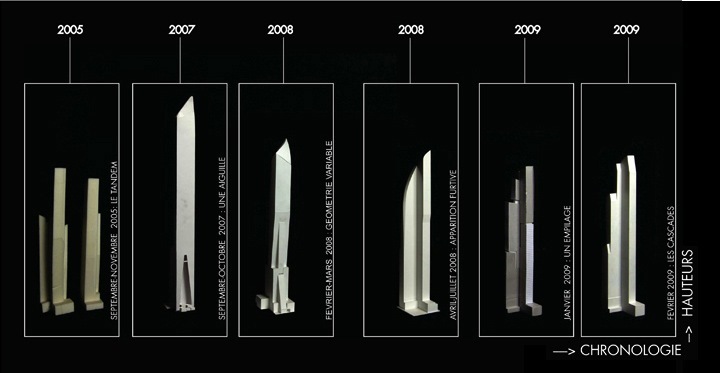 Models of One57's evolution from 2005 to 2009. Courtesy of Atelier Christian de Portzamparc Architects. 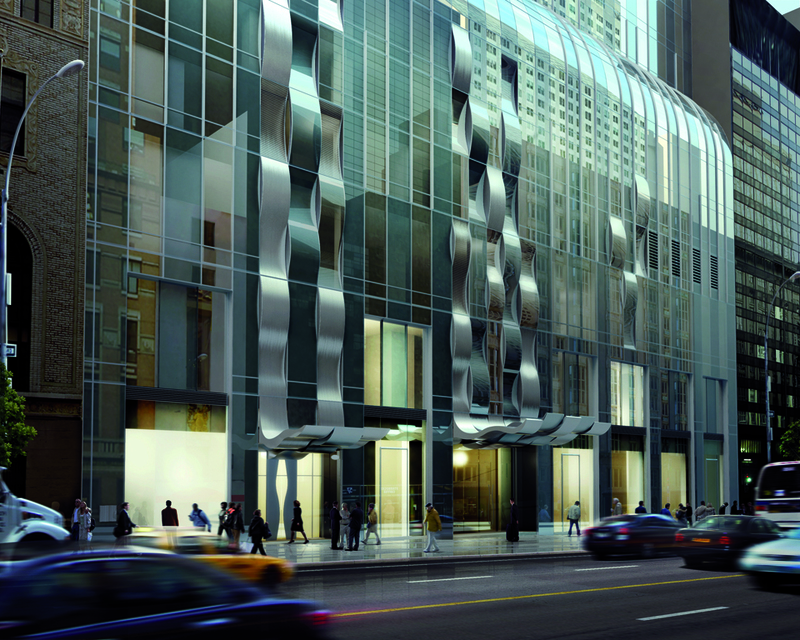 Although Barnett had begun to acquire buildings and air rights as early as 1998, the first design for One57 began in 2005 when the developer commissioned the Pritzker Prize-winning French architect Christian de Portzamparc to prepare design studies for a pair of towers for the two sites one block apart that he owned on W. 57th Street. (The second site is the group of lots that in fall 2013 were in design development by Smith + Gill.) In July 2007, Portzamparc was commissioned to develop the design for the mixed-use, hotel and condominium tower at 157 W. 57 that would rise to 300 meters (c. 1,000 ft.) and thus become the tallest residential building in the city. 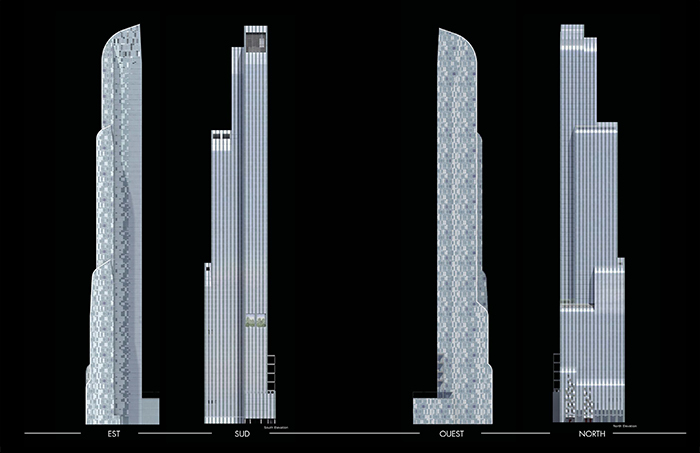 Elevations of One57. Courtesy of Atelier Christian de Portzamparc Architects. View from 57th St. Courtesy of Extell Development. The slenderness and massing strategies evolved in dozens of study models in 2008, and the tower reached its definitive form in 2009 in a project the Portzamparc Atelier called "les cascades," referring to the imagery of flowing waterfalls. The curtain wall treatment of varicolored glass panels of blue, gray, and silver reinforced the trope of reflections on water, but Portzamparc also used the term "Klimt effect" to describe the fa�ade, suggesting the mosaic-like decorations of the Viennese modernist painter. 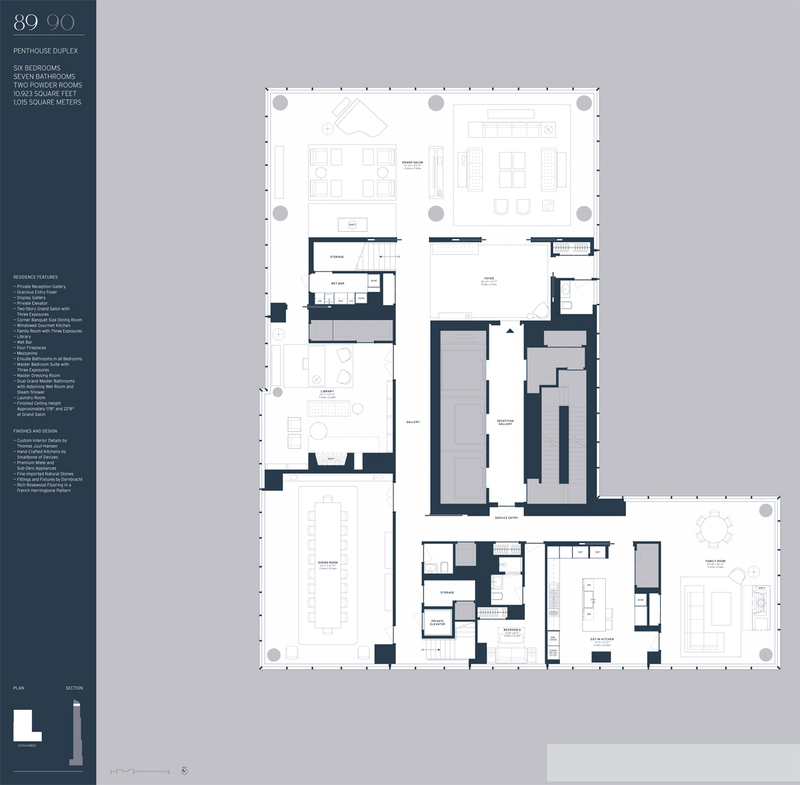 One57 Penthouse Floor plan. Courtesy of Extell Development. 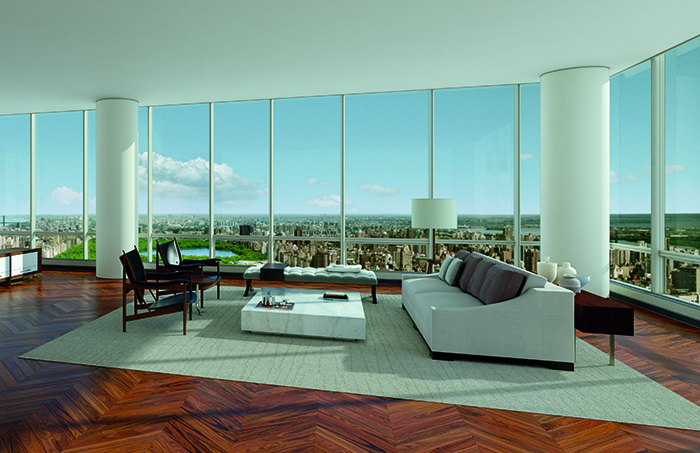 Interior of One57. Courtesy of Extell Development. 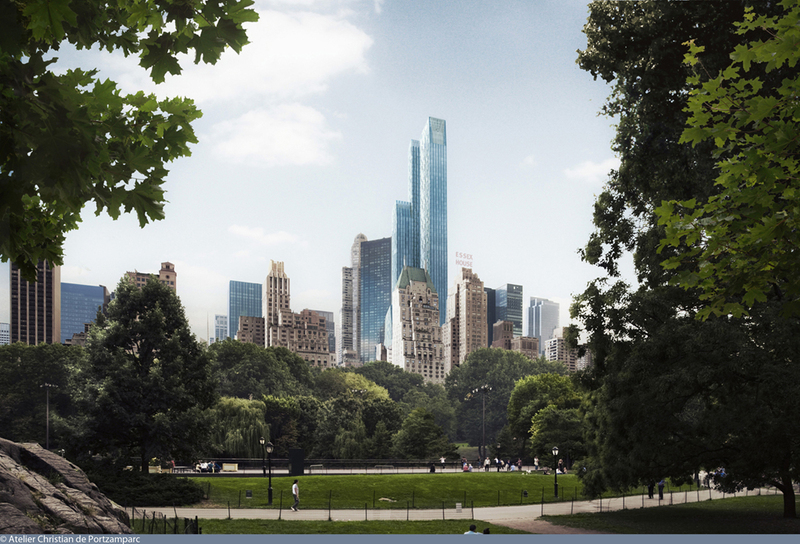 The objective of the tower design and floor plans was to maximize views of Central Park. 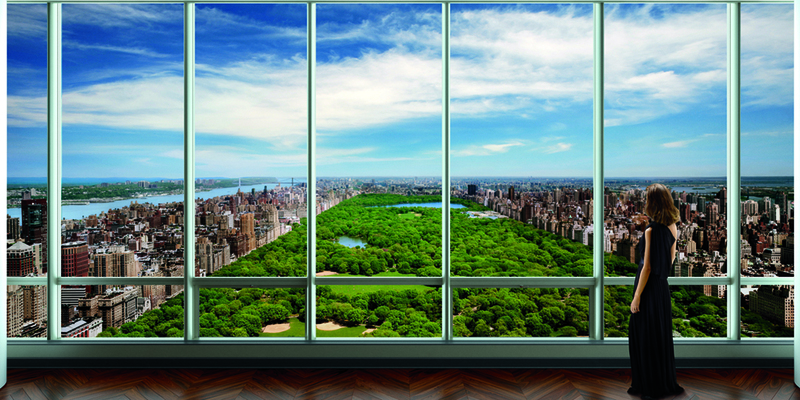 View from One57 towards Central Park. Courtesy of Extell Development. A promotional video for One57 visualizes architect Christian de Portzamparc's trope as a fountain of rising and cascading water and scintillating surfaces. The camera swivels around the building to show One57 dominating the Midtown skyline. G.F.A: 853,567 sq. ft. | 79,299 sq. m.